The plane took off from New York's John F. Kennedy Airport on Monday and is making its way across the Atlantic Ocean to Seville, Spain. If successful, it would be the first time an emissions-free airplane has crossed the Atlantic. Solar Impulse 2 is expected to land in Seville on June 23rd after a four-day, nonstop flight. It's not the first time the pilot, Bertrand Piccard, has made the journey, but this trip may be his most significant. "Lindbergh’s transatlantic flight marked a new area in aviation and contributed to the progress of air transport on a large scale," Piccard said. 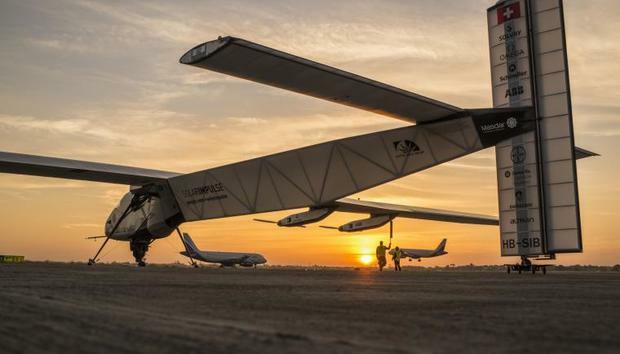 "With Solar Impulse, our aim is to encourage the deployment of clean technologies everywhere. If an airplane can fly day and night without fuel, everybody could use these same efficient solutions in their daily lives." From Spain, Solar Impulse 2 will continue on to Abu Dhabi, where it began it's journey in March 2015. You can follow the plane's progress online here.